An ash plume billows from the crater atop Mount St. Helens hours after its eruption began on May 18th, 1980, in Washington state. The column of ash and gas reached 15 miles into the atmosphere, depositing ash across a dozen states. 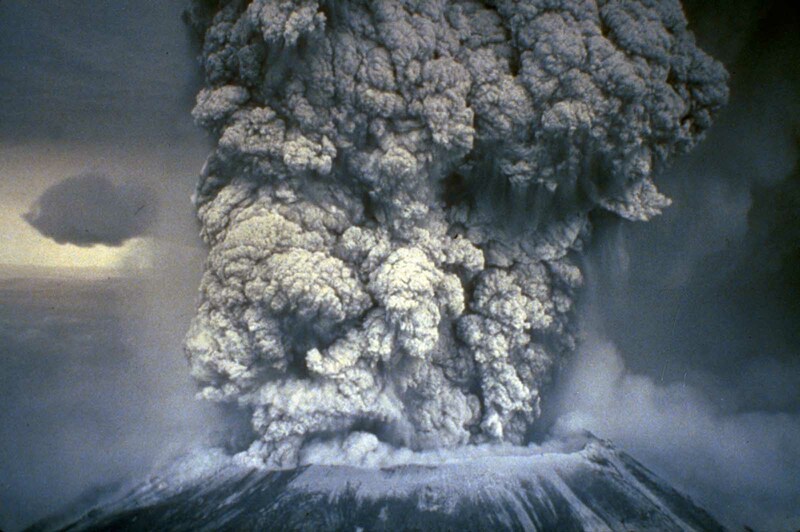 Mount St. Helens erupted on May 18, 1980. The volcano, located in southwestern Washington, used to be a beautiful symmetrical cone about 9,600 feet (3,000 meters) above sea level. The eruption, which removed the upper 1,300 feet (396 meters) of the summit, left a horseshoe-shaped crater and a barren wasteland. The eruption (a VEI 5 event) was the only significant volcanic eruption to occur in the contiguous 48 U.S. states since the 1915 eruption of Lassen Peak in California. However, it has often been declared as the most disastrous volcanic eruption in United States history. The eruption was preceded by a two-month series of earthquakes and steam-venting episodes, caused by an injection of magma at shallow depth below the volcano that created a large bulge and a fracture system on the mountain’s north slope. 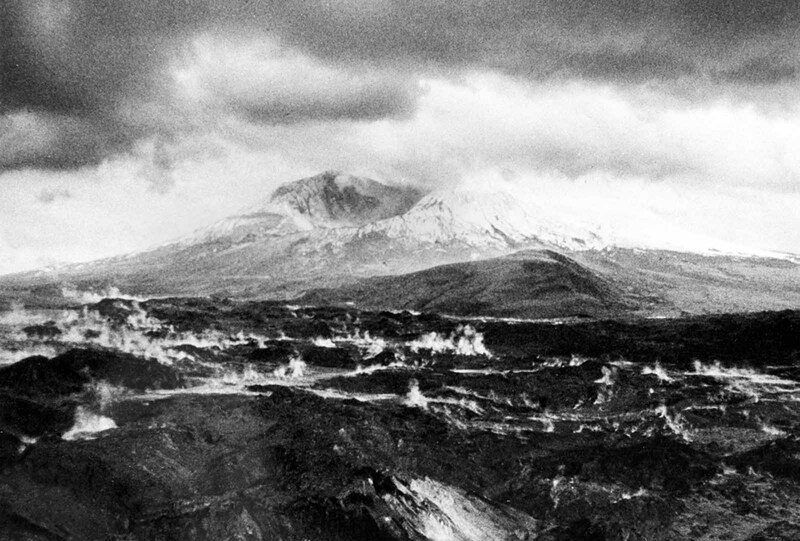 Mount St. Helens, as it looked the day before its massive eruption, on May 17, 1980. On March 27, after hundreds of additional earthquakes, the volcano produced its first eruption in over 100 years. 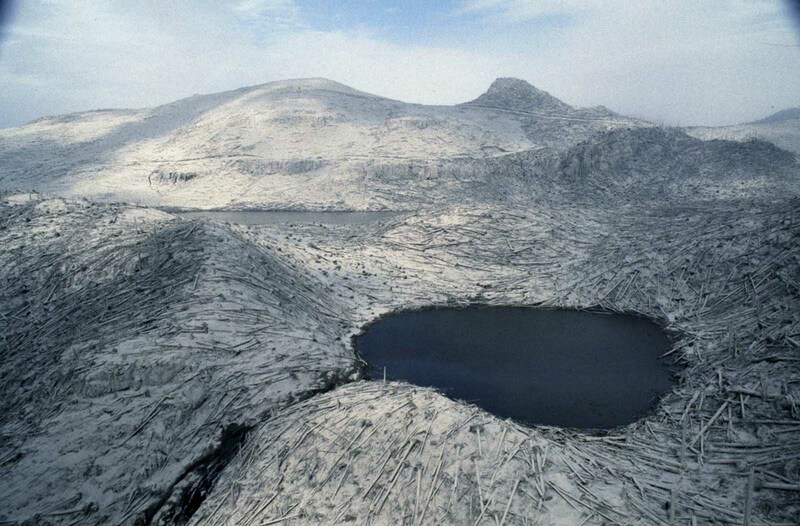 Steam explosions blasted a 60- to 75-m (200- to 250-ft) wide crater through the volcano’s summit ice cap and covered the snow-clad southeast sector with dark ash. Steam-blast (phreatic) eruption from the summit crater of Mount St. Helens on April 6, 1980. Within a week the crater had grown to about 400 m (1,300 ft) in diameter and two giant crack systems crossed the entire summit area. 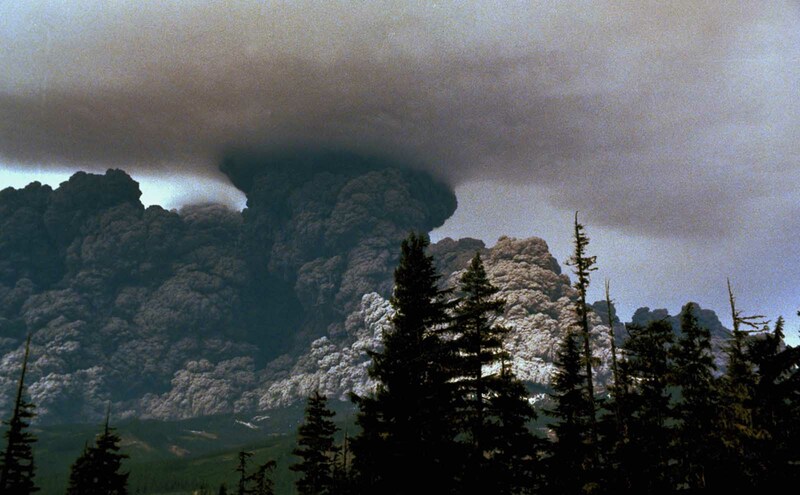 The eruption column rose 80,000 feet (24 km; 15 mi) into the atmosphere and deposited ash in 11 U.S. states. At the same time, snow, ice and several entire glaciers on the volcano melted, forming a series of large lahars (volcanic mudslides) that reached as far as the Columbia River, nearly 50 miles (80 km) to the southwest. Less severe outbursts continued into the next day, only to be followed by other large, but not as destructive, eruptions later that year. Thermal energy released during the eruption was equal to 26 megatons. Approximately 57 people were killed directly, including innkeeper Harry R. Truman, photographers Reid Blackburn and Robert Landsburg, and geologist David A. Johnston. Hundreds of square miles were reduced to wasteland, causing over a billion U.S. dollars in damage ($3.03 billion in 2017 dollars ), thousands of animals were killed, and Mount St. Helens was left with a crater on its north side. 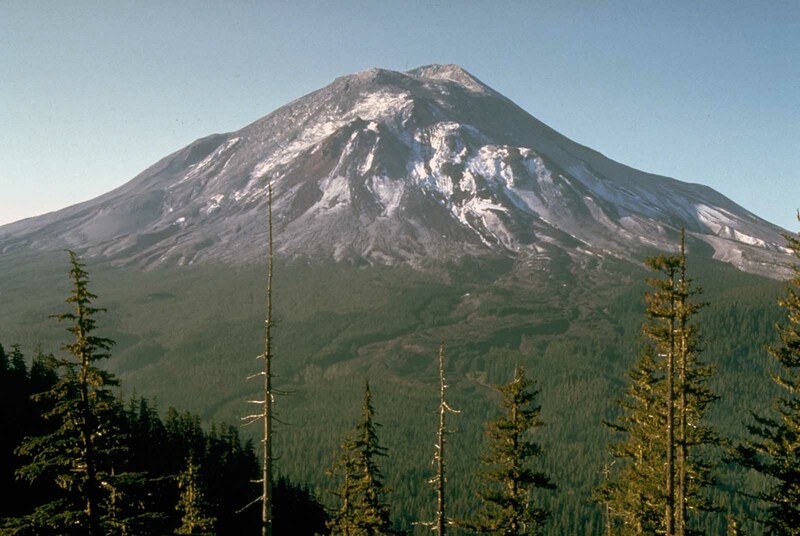 At the time of the eruption, the summit of the volcano was owned by the Burlington Northern Railroad, but afterward the land passed to the United States Forest Service. 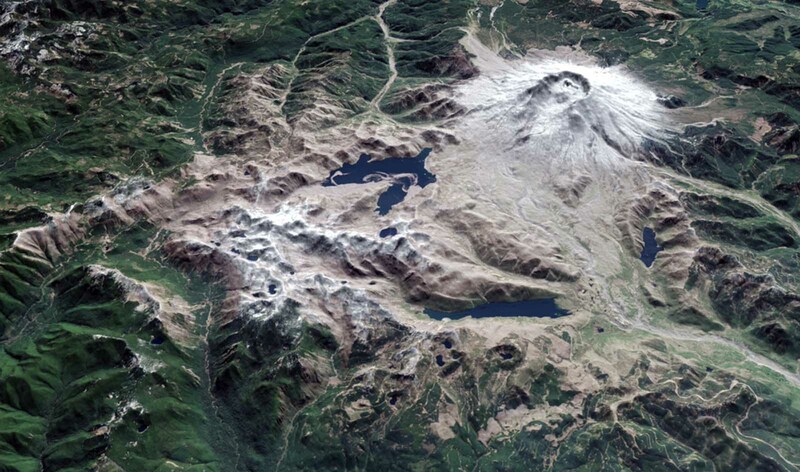 The area was later preserved, as it was, in the Mount St. Helens National Volcanic Monument. 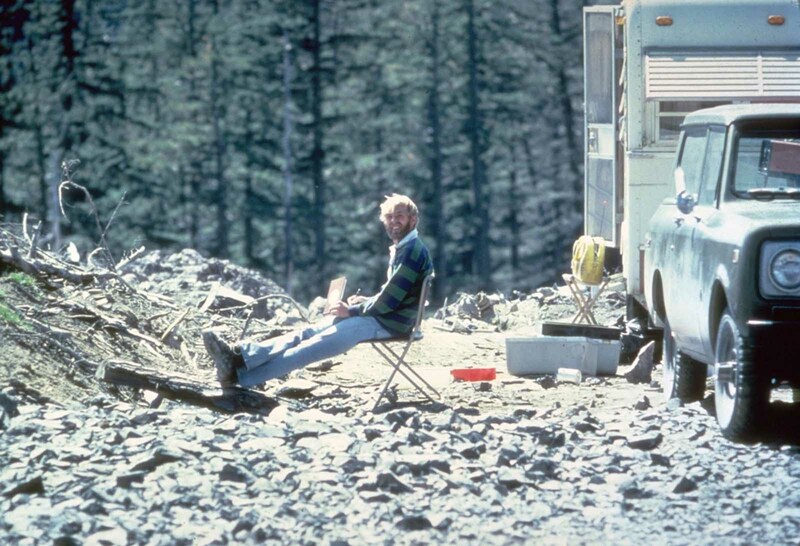 On May 17, 1980, vulcanologist David Johnston sits at Coldwater II camp near Mt. St. Helens. At 8:32 a.m. the next morning, Johnston radioed a message to the USGS headquarters: “Vancouver, Vancouver, this is it!” Johnston did not survive the eruption. Coldwater II was later re-named “Johnston Ridge” in honor of Johnston. 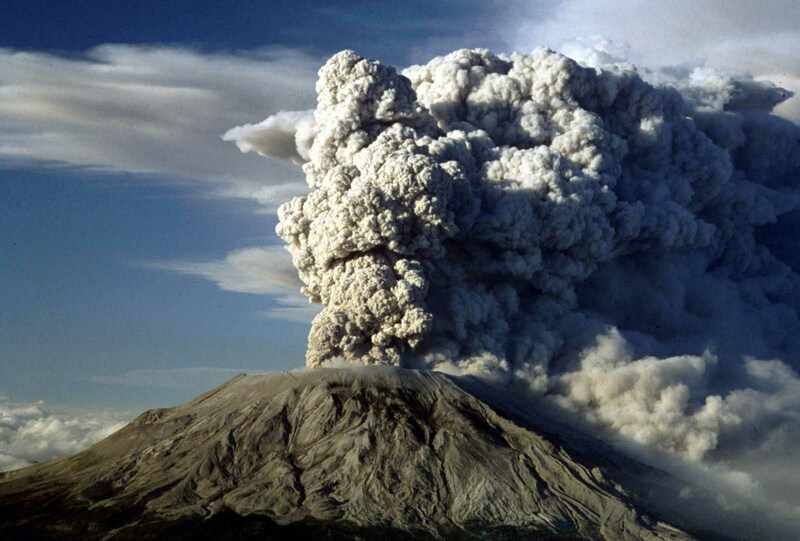 Mount St. Helens erupts again, on July 22, 1980. 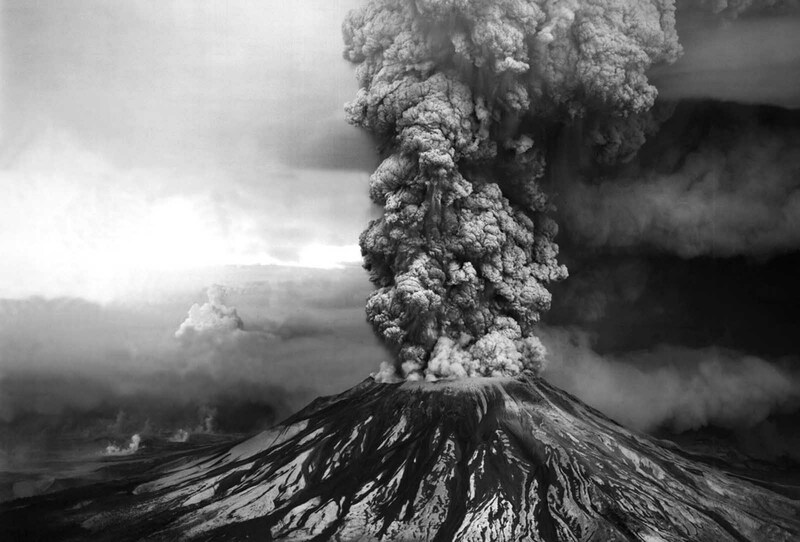 Mount St. Helens erupts on May 18, 1980. Mt. St. Helens, May 18, 1980. 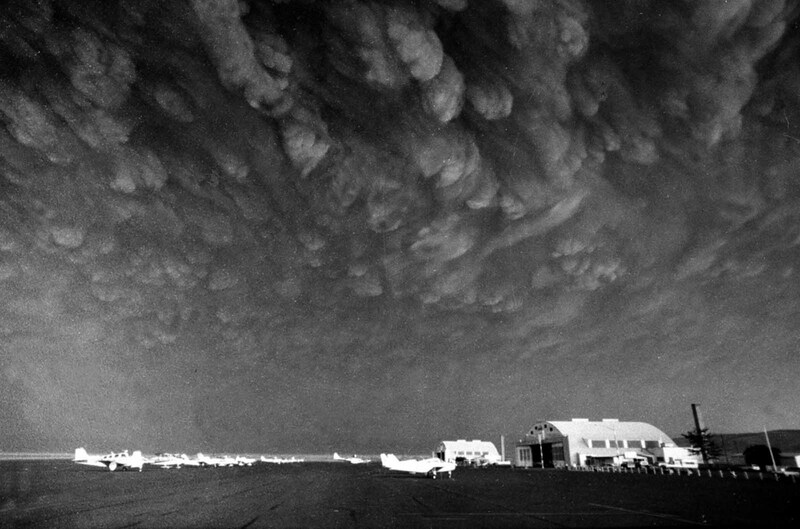 Ash clouds from Mount St. Helens move over Ephrata airport in Washington on Monday, May 19, 1980. Communities across central and eastern Washington were covered in 3-5 inches of gritty, fine, ash particles. A house is submerged along the Toutle River which flooded in the aftermath of the eruption of Mount St. Helens on May 19, 1980. Area streams and rivers rose quickly as ice and snow on the volcano melted instantly. 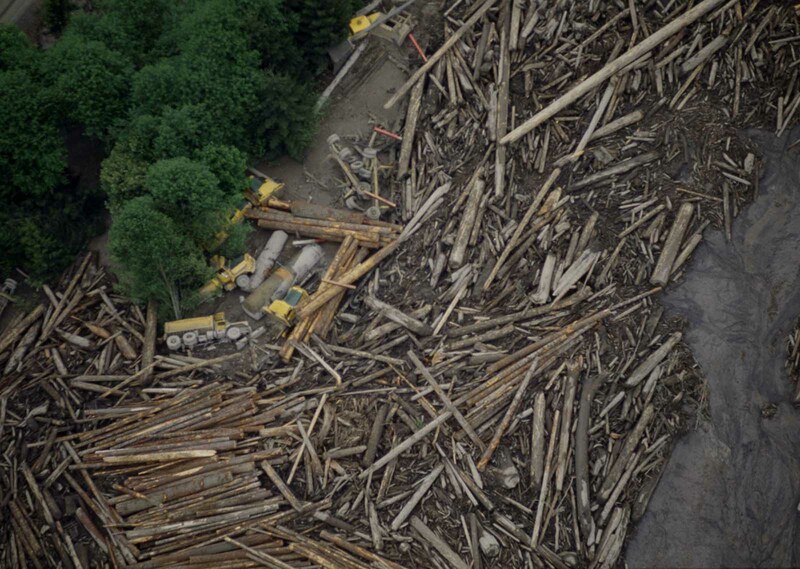 A logging operation along the Toutle River, Washington, about 20 miles from Mount St. Helens, in ruins after flooding from ice and snow melt from the mountain, in May of 1980. Bob Brown, left, and his brother John attempt to lead three horses to safety out of the Weyerhaeuser 19 Mile camp in Kid Valley, Washington. 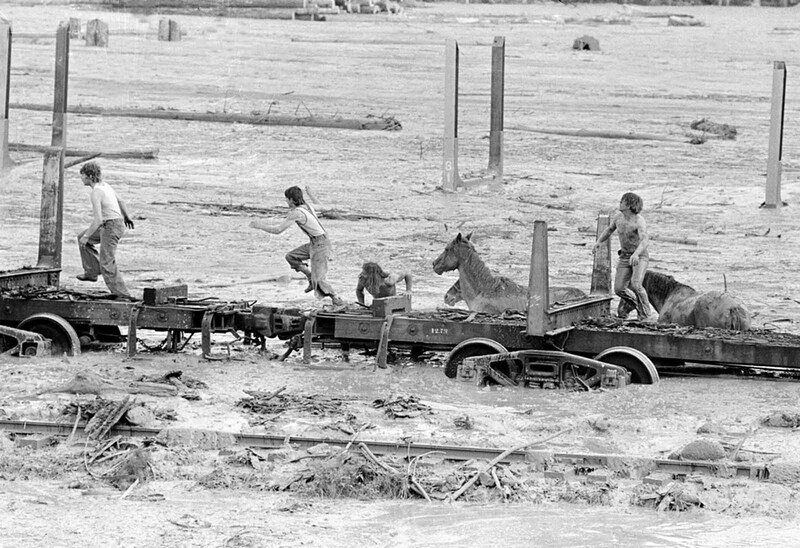 The yard was flooded by the Toutle River following the eruption of Mount St. Helens. 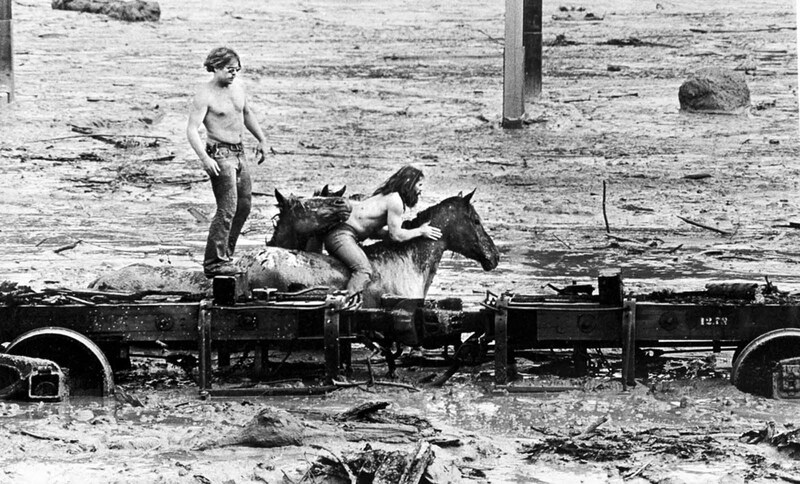 Bob Brown (right) and John Brown climb onto railroad car, heading down the train along with two additional would-be horse rescuers, giving up their efforts as they flee for their lives as flood waters from the Toutle River begin a sudden rise on May 19, 1980. All four people reached safety but the horses are presumed to have drowned. 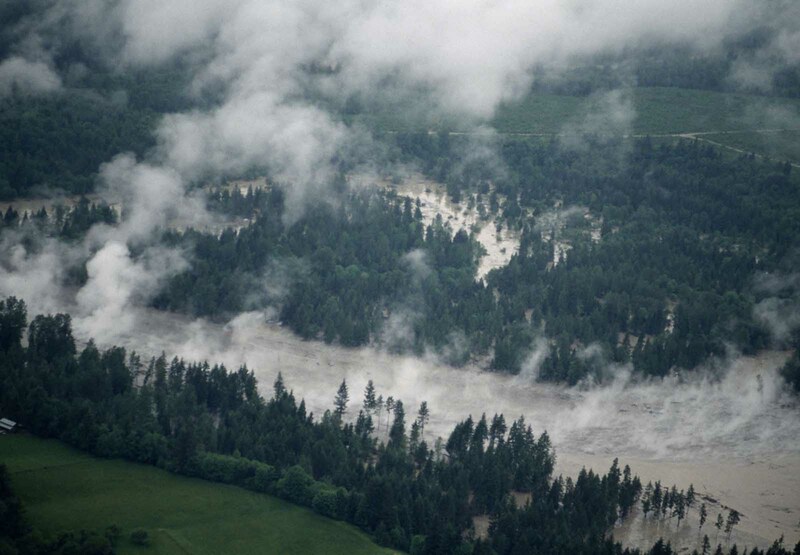 Steam rises from hot water in a river following the aftermath of the eruption of Mount St. Helens, on May 19, 1980. Aerial view of timber blowdown, destroyed by the May 18 eruption of Mount St. Helens, in Skamania County, Washington, on June 8, 1980. The crater left at the summit of Mt. 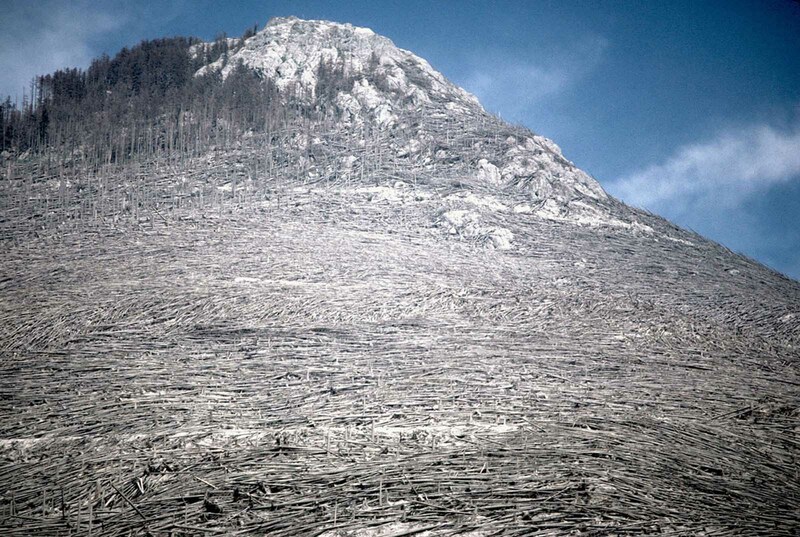 St. Helens, after it lost more than 1,300 feet of elevation to the catastrophic landslide and eruption of May 18, 1980, the surrounding landscape still steaming. 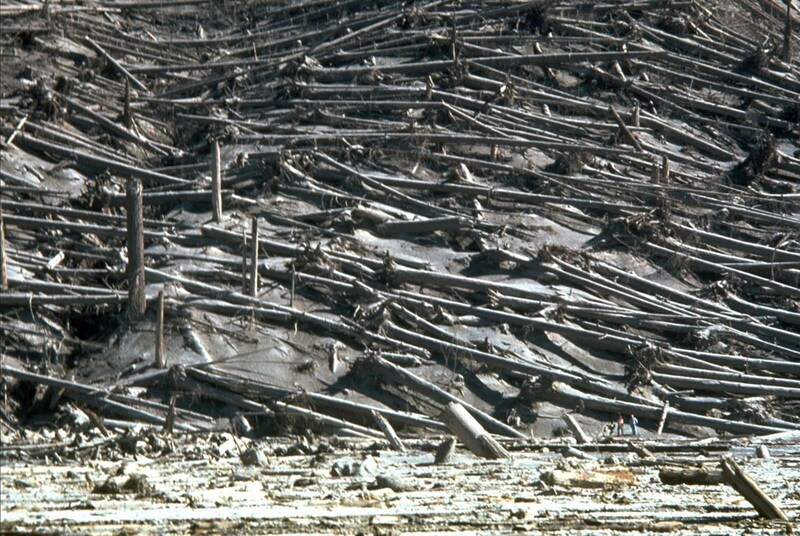 Blowdown of trees from the May 18, 1980, eruption of Mount St. Helens, viewed on August 22, 1980. 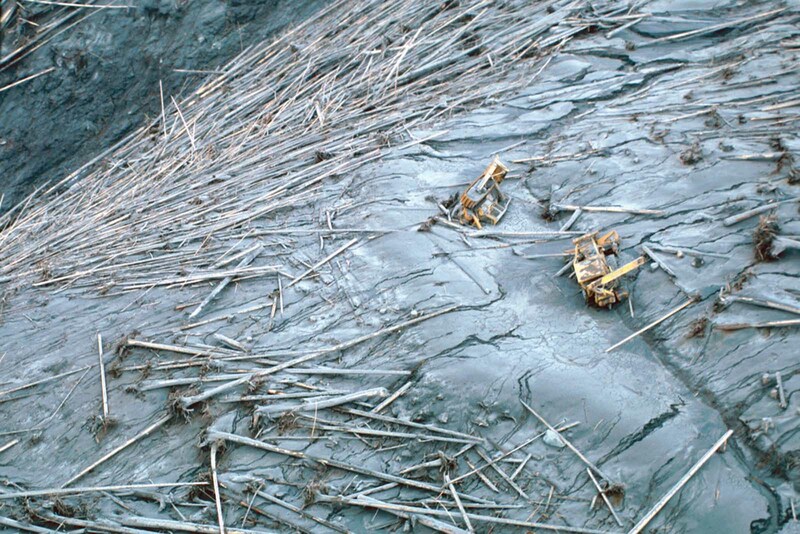 Damaged equipment on south side of Elk Rock, northwest of Mount St. Helens, in Cowlitz County, Washington, on June 5, 1980. 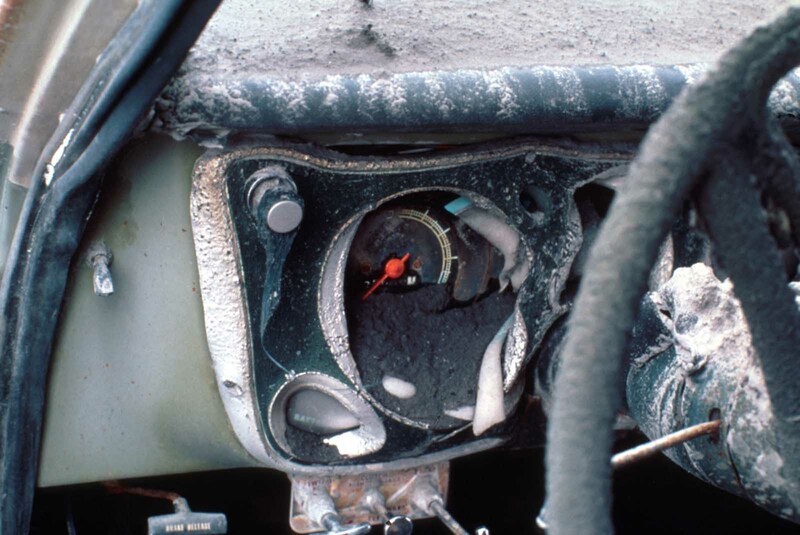 The melted dashboard of pickup truck located on ridge top about 14 km north of Mount St. Helens, in Skamania County, Washington, on June 18, 1980. 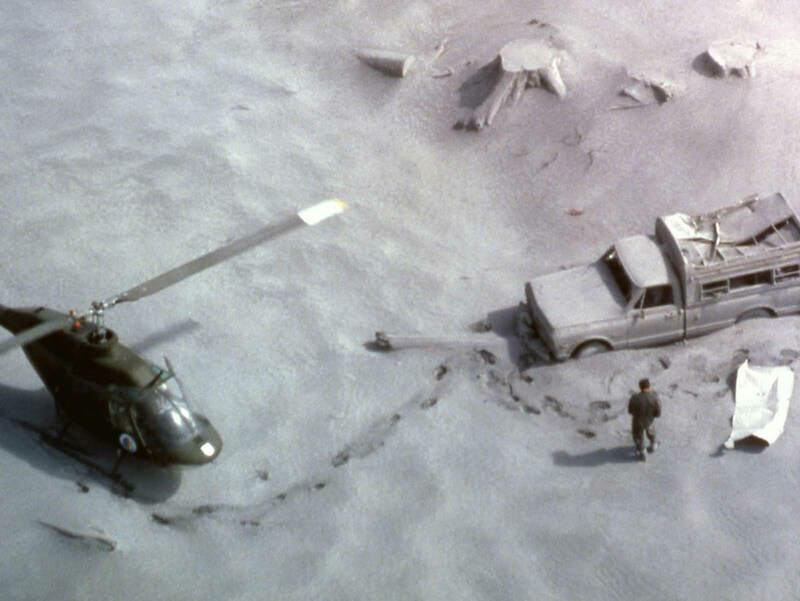 A National Guard member identifies victims of the eruption of Mt St Helens. 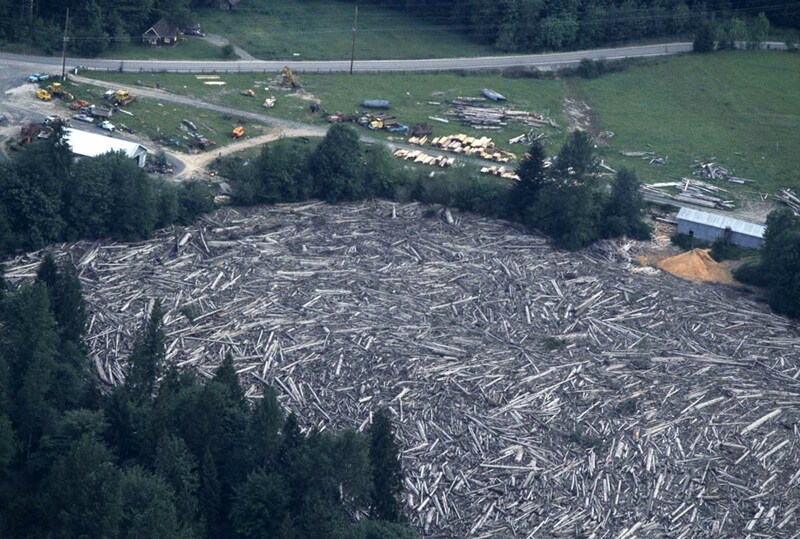 An aerial view of destruction of logging operation after floods following Mount St. Helens’ eruption, shown on May 20, 1980. The streets of Yakima, Washington, are dark at 3:00 p.m. after an eruption of Mount St. Helens on May 18, 1980. 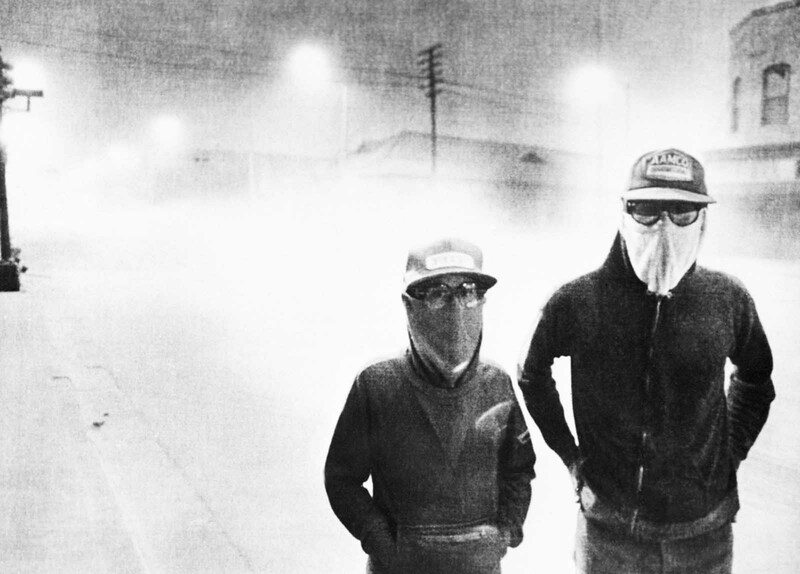 Volcanic ash covered the streets as people wore masks to avoid breathing the particles. 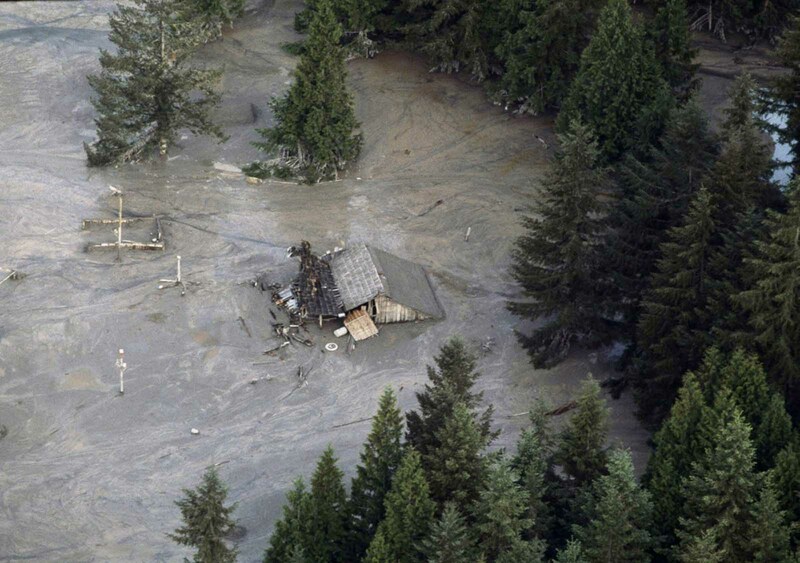 A solidified mudflow covers State Highway 504 near the town of Toutle, northwest of Mount St. Helens, to a depth of 2 m (6 ft). Geologist for scale. A wrecked logging truck and crawler tractor are shown amidst ash and downed trees near Mount St. Helens two days after an explosive eruption. 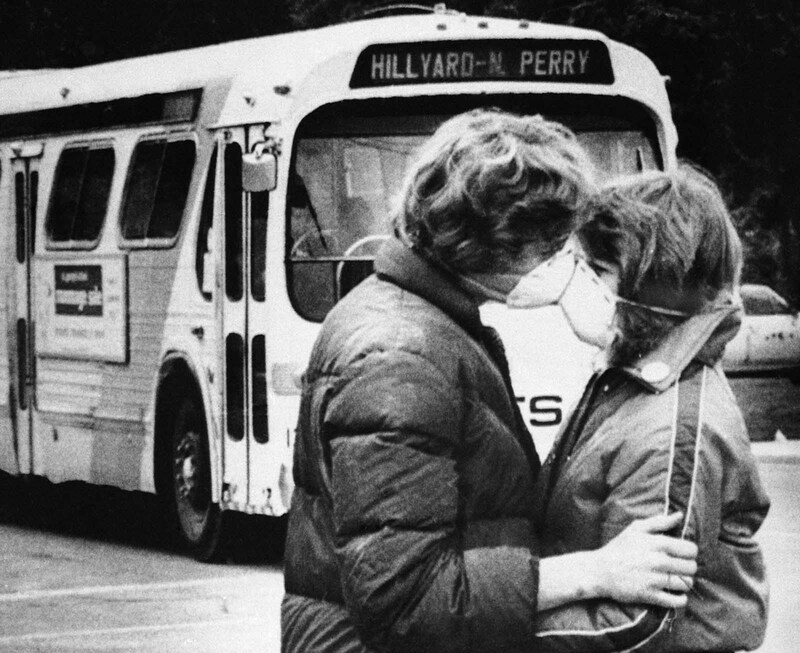 Fifteen-year-old Heidi Havens gives Allen Troup, 16, a kiss as he prepares to board a Spokane City bus, on May 27, 1980. Spokane residents had to wear face masks while outside for days after the eruption because of possible health threats from volcanic ash sprayed over the area by Mount St. Helens on May 18. 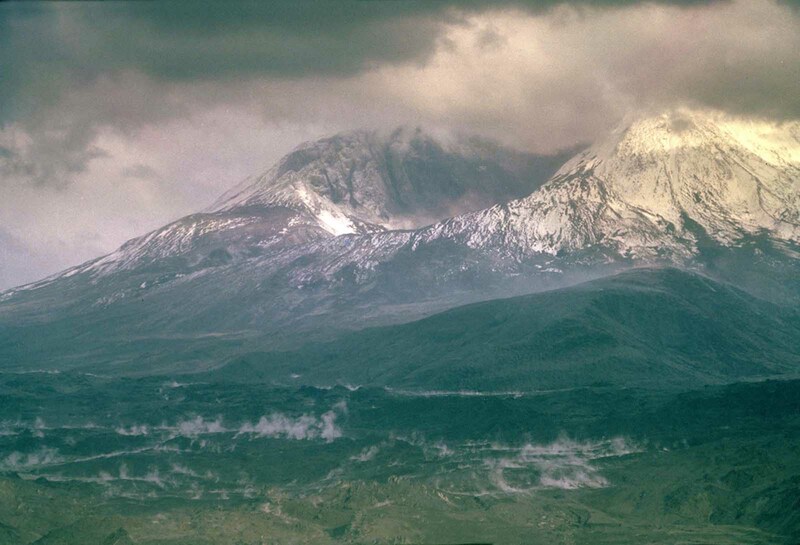 Mount St. Helens, shortly after the eruption pf May 18, 1980. 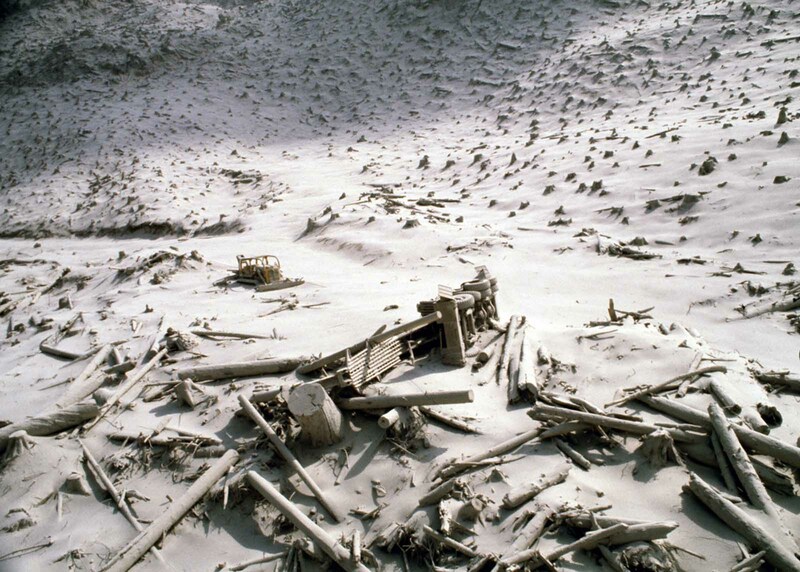 The slopes of Smith Creek valley, east of Mount St. Helens, show trees blown down by the May 18, 1980 lateral blast. Two U.S. Geological Survey scientists (lower right) give scale. The direction of the blast—shown here from left to right—is apparent in the alignment of the downed trees. Over four billion board feet of usable timber, enough to build 150,000 homes, was damaged or destroyed. 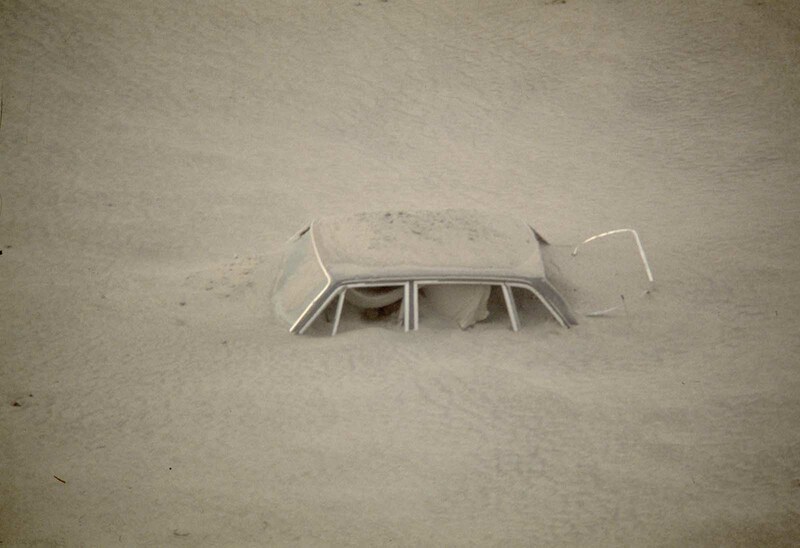 A car sits submerged in ash in this May 20, 1980 photo from the Mount St. Helen eruption in Washington State. 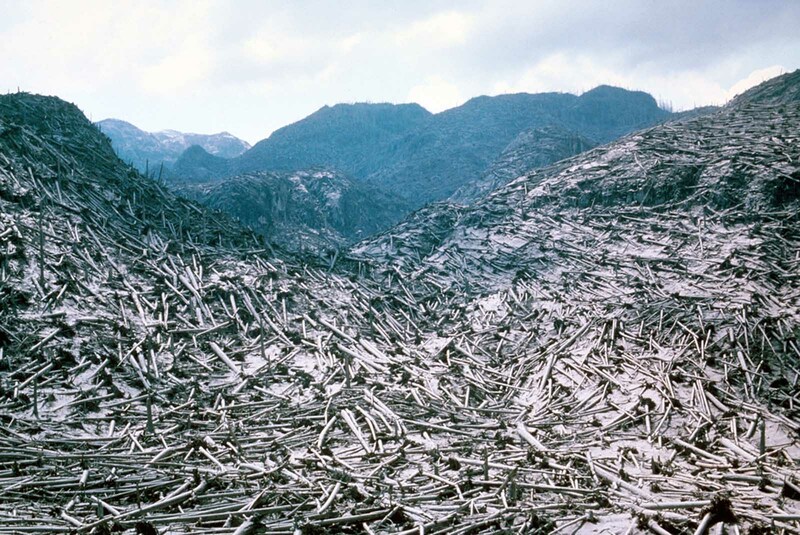 Denuded trees lay like matchsticks in the changed landscape around Mount St. Helens, shown two days after eruption, on May 20, 1980. 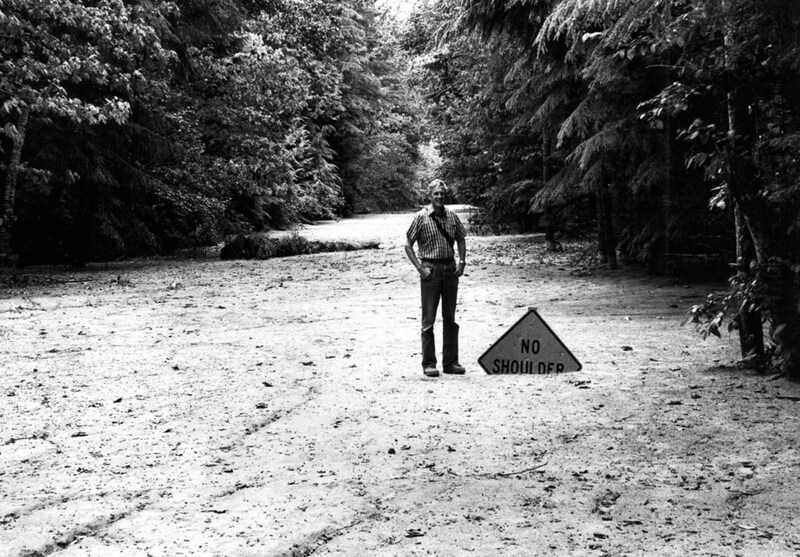 A Washington state geologist and a reporter walk toward the crater of Mount St. Helens in May of 1981, almost a year after the volcano exploded, causing dramatic destruction for miles around. 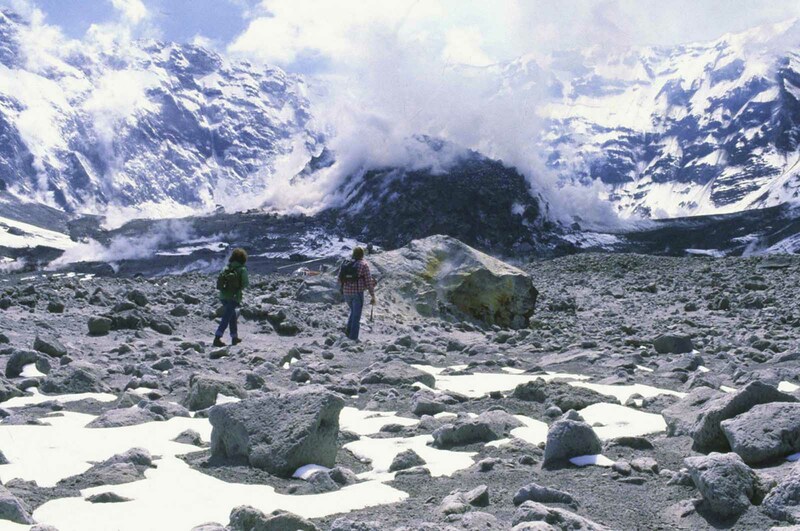 They were near the steaming lava dome with the snow-covered crater wall beyond. 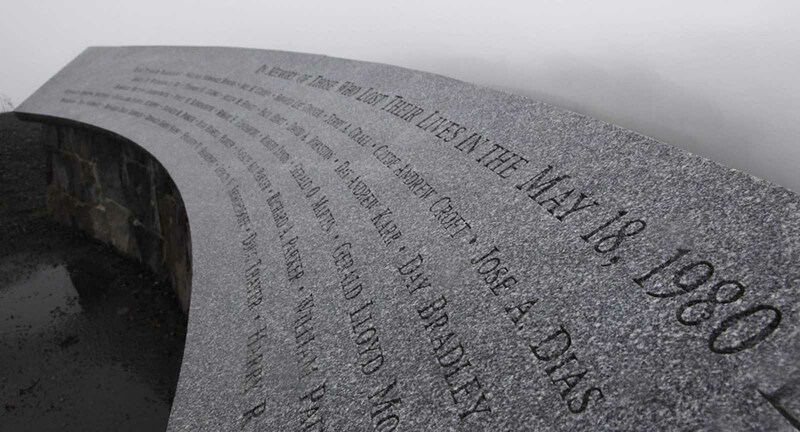 A memorial to those who lost their lives in the May 18, 1980 eruption of Mount St. Helens, photographed on May 18, 2010, in Washington state. Satellites in orbit and scientists on the ground still monitor the mountain and track the recovery of Mt. St. Helens. This image shows a three-dimensional view of the mountain, looking toward the southeast, as it appeared on April 30, 2015. The image was assembled from data acquired by the Operational Land Imager on Landsat 8 and the Advanced Spaceborne Thermal Emission and Reflection Radiometer (ASTER) on Terra. (Photo credit: USGS Cascades Volcano Observatory / AP).